Single domain protein with poorly structured N- and C-termini. Structurally variable regions were removed from NMR models for evaluation of predictions. Rossmann-like doubly-wound α/β-sandwich fold SAM-dependent methyltransferase. A shortened, minimal version of SAM-methyltransferase structure. The third (edge) β-strand (green) is very short, as the following it crossover helix (green in the back). The helices between strands 2 and 3 (green) and 5 and 6 (orange) deteriorated into loops. The C-terminal β-hairpin, which is a distinguishing feature of SAM-methyltransferase is well-developed. Thus the last (7th, red) β-strand is parallel to the rest in the β-sheet. Comparative modeling: hard. Closest templates detectable by PSI-BLAST, but contain many insertions and are quite different in the details of the structure. Additionally, many servers missed the C-terminal β-hairpin because in closest templates it is separated from the rest of the sequence by a long insertion. Many SAM-dependent methyltransferases. One of the closest templates is 3bxo. However, this template contains a very long insertion before the C-terminal β-hairpin. 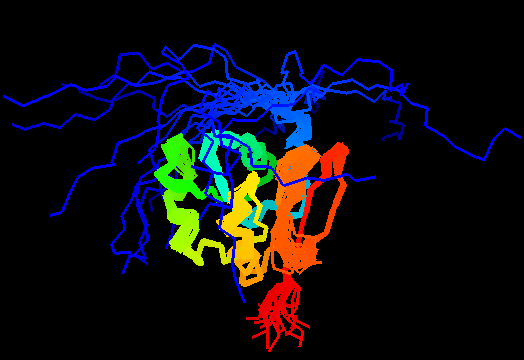 NMR models contain 20 N-terminal His-tag residues 1-MGSSHHHHHHSSGLVPRGSH-20, not present in the target sequence. Most of this regions was removed from NMR models due to disorder anyway. Uncharacterized protein family UPF0146 in Pfam, which includes several close homologs. Many servers missed the C-terminal β-hairpin due to long insertions in closest templates prior to it. This hairpin is characteristic of SAM-methyltransferases. First models for T0471: Gaussian kernel density estimation for GDT-TS scores of the first server models, plotted at various bandwidths (=standard deviations). The GDT-TS scores are shown as a spectrum along the horizontal axis: each bar represents first server model. The bars are colored green, gray and black for top 10, bottom 25% and the rest of servers. The family of curves with varying bandwidth is shown. Bandwidth varies from 0.3 to 8.2 GDT-TS % units with a step of 0.1, which corresponds to the color ramp from magenta through blue to cyan. Thicker curves: red, yellow-framed brown and black, correspond to bandwidths 1, 2 and 4 respectively.